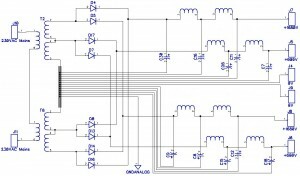 Riddle: How do I get a low DC voltage from a pair of high voltage power supply transformers ? 1200 – 0 – 1200 V AC … How do I obtain a low DC voltage ? Obviously, the high voltage was initially intended to provide B+ HV to the output stage and output tube. Fine … but what about the driver tube ? What about the input tube ? From where should I power these ? I think that I found a solution to the riddle that is associated with the less than optimal power supply transformers that I have acquired in that bulk purchase of the GM-70 monoblocks set. So, the idea is as above. The goal is to get 600 V DC for the driver stage. But how is it supposed to work? These are the two transformers available, say “A” and “B”. Primary: 230VAC (s) ==> Center tapped secondary 1200V AC – 0V AC – 1200V AC. The primary windings of the transformers are connected in series. The series is powered from mains, which in my case is 230VAC. Each transformer is thus supplied with voltage 115 VAC, exactly divided into two equal voltages (*) (explanation shall follow). The secondaries are connected abnormally: the bottom side tap of Xfrmr_A is connected with the top side tap of Xfrmr_B. Relative to such newly created “common center” point, which also constitutes my signal ground, we shall obtain two distinct pairs of AC voltages: 600 V from the “middle” taps, and 1200 V from the farthest out taps. Having such voltages, I now have the freedom to create +600V DC, to be generated full bridge, but loading symmetrically both of the transformers: Xfrmr_A and Xfrmr_B. The first rectifier diode charging the (choke front loaded) filter capacitor comes from Xfrmr_A. The second rectifier diode charging the (choke front loaded) filter capacitor comes from Xfrmr_B. We therefore symmetrically load both of the transformers: each is loaded with a half-sine wave being rectified and fed in to the filter. Such even loading of the secondary sides of the disparate transformers achieves a self “load balancing” act, as seen from their primary windings, and thus guarantees that the primary windings split the mains voltage exactly in halves, i.e. 115V AC each. Well, and now comes the icing on the top of the cake: The choke front loaded filter actually helps me hammer down the DC output voltage to the value of the RMS of the AC voltage. The DC voltage shall only be +600V DC. If I were to use a traditional, capacitor front loaded filter, the output voltage would be 1,4 times higher, i.e. somewhere around or over 800V DC. In order to create +1680 V DC, full bridge, I also symmetrically load both of the transformers. As before, the rectifier diodes are strapped so that each half sine wave is taken from a disparate transformer. The first rectifier diode – from Xfrmr_A. The second rectifier diode – from Xfrmr_B. 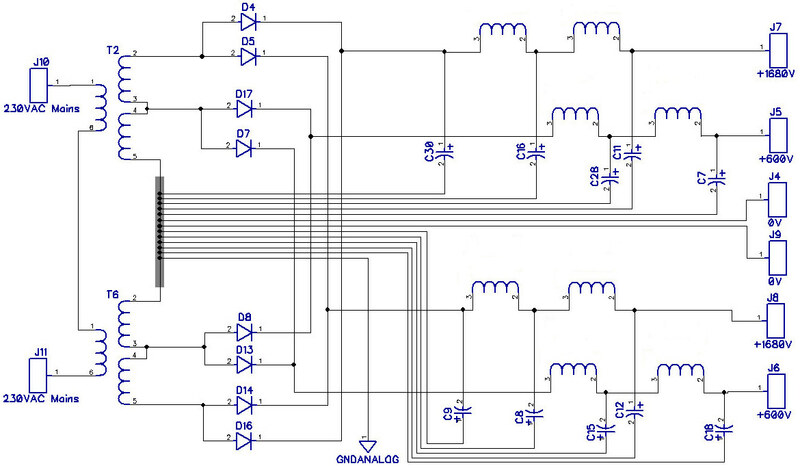 Please note that in this case, I am using a traditional Capacitance front loaded filter, so as to obtain the 1,4 x voltage multiplication, which in the case of the output tube, I can put do serve a good purpose. After all, the GM-70 is indeed a radio transmitter tube. It simply *loves* to work in high voltage conditions. P.S. Why on earth so many individual “ground” wires ? This is a so called star grounding scheme, but taken to extremes. At the design stage, it costs me close to absolutely nothing to route these return ground paths according to the book. Since I’m designing this from scratch, why not go to extremes … and do it from the outset extremely properly ?